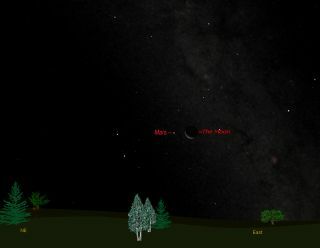 This sky map shows where the moon and Mars will appear at 4 a.m. local time on Aug. 25, 2011 to observers in mid-northern latitudes with clear skies. The planet Mars currently appears rather dull and uninteresting in the night sky, yet it is also drawing nearer to us with each passing day. As we noted last month, 2011 is an "off year" for the fabled Red Planet, since it does not come to opposition — that point in the sky placing it opposite to the sun. Having only emerged from the glare of the rising sun during June, Mars is now visible in a dark sky, rising this week shortly before 2:30 a.m. local time. And during the predawn hours of Thursday (Aug. 25), Mars will have a visitor: a slender waning crescent moon that will appear to rise side-by-side with Mars from beyond the east-northeast horizon. The pair will be separated by about 4 degrees. Your clenched fist held at arm's length measures roughly 10 degrees, so early on Thursday morning Mars will appear as a bright "star" situated less than a “half fist” to the left of the moon. The sky map of the moon and Mars here shows how the two objects will appear early Thursday. A couple of hours later, as dawn is about to break, Mars and the moon will climb higher up in the sky, and you may notice also how Mars forms a striking isosceles triangle with the "Twin Stars" of Gemini, Pollux and Castor. There's a wonderful symmetry of colors and illumination here: Orange Pollux shines at magnitude +1.2 on the scale used to identify a sky object's brightness (the lower the number, the brighter the object). Meanwhile, yellow-orange Mars glows at magnitude +1.4 and whitish Castor is magnitude +1.6. On the moon, you may also notice the phenomenon known as earthshine; sunlight reflected off of the Earth and re-reflected back toward the moon. That eerie blue-gray glow apparently lighting up the dark side of the moon is sunlight that has bounced off the clouds and oceans of our home planet and directed up to the moon. Check out the moon with binoculars or a small telescope and this effect will impart a striking three-dimensional appearance. Mars is currently 188 million miles (302 million km) from Earth, and approaching us at a rate of 521,000 miles (838,000 kilometers) per day. But the planet is still more than six months from opposition — March 3, 2012. So while Mars is indeed getting nearer, any brightening, at least for now, will be very slow. And if you have a telescope, certainly try it out on the moon, but don't bother with Mars just yet. It's still much too small — only 4 1/2 arc-seconds across — to be of any telescopic interest. That's only 1/400 the apparent size of the moon.